With so many people feeling entitled nowadays, appreciation has become almost obsolete. 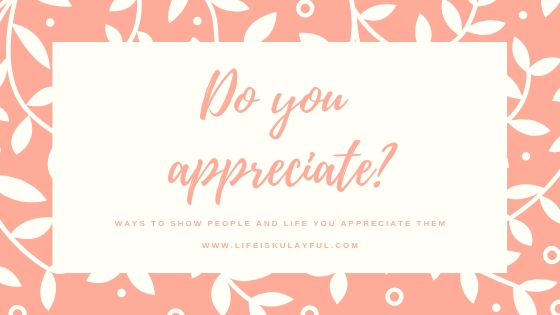 People just think that they deserve this and that, that they should be given this and that, that the concept of gratitude and appreciation has become a thing of the past. I teach my son that value of "PLEASE' and "THANK YOU" all the time. I strongly believe that these two things are the most basic way to show people you appreciate what they do for you. When you say please, you are showing that you are not taking it for granted that they will do something for you. When you say thank you, you are showing that you are grateful for what they did for you. Time is the one thing that we can truly give to people. Spend an afternoon, have dinner, go for coffee, or simply sit down and listen to them. Hugging is actually very therapeutic. When you want someone you appreciate having them in your life but you are not really good in using word, a simple hug works wonder. 3. Write them a note. This is inexpensive and heartfelt. There is also nothing more sincere than a written note that is written from the heart. In this day and age where everything is digital, take the time to print a photo that has an awesome background and memory then give it to someone special. Having a framed, printed photo can always evoke a smile on someone's face. Whatever your style is, whatever your way is of showing gratitude, what matters in life is that we always remember to appreciate what we have in life and who we have in life.